A woman who died of Ebola this week in Liberia, months after it was declared Ebola-free, had travelled to Guinea with her three children, one of whom is also sick, the health ministry said on Sunday. The 30-year-old woman died of the deadly virus on Thursday while being transferred to hospital in the capital Monrovia, more than two months after the epidemic had been declared over in the country. George Sornor, the ministry's communication's officer, told AFP that the unidentified woman had crossed into Liberia from neighbouring Guinea, where a fresh Ebola outbreak has killed seven of the eight cases registered since mid March. Liberia had closed its borders with Guinea after news of the outbreak March 17 and had reopened them several days later until Friday, after the woman died. "The woman came from Guinea on the 21st of March when the borders were closed. We don't know how she crossed," Sornor said. "Her husband in Guinea just died from the virus. She came to Liberia with her three children. One of those children is down with the virus. Now, we have two cases in the country." He said authorities were checking on 46 people who had contact with the infected woman and that four people were in the Ebola Treatment Unit, her three children and her sister. 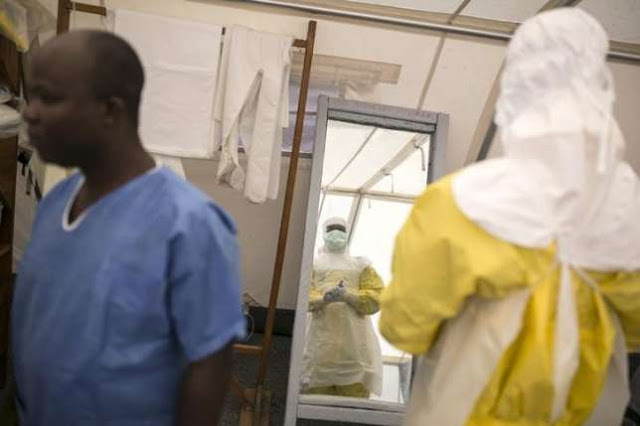 On Saturday, the ministry put out a statement urging citizens "not to panic in the wake of the new Ebola case"
Sierra Leone has announced beefed up security measures along with screening and surveillance points at all border crossings with Guinea. Liberia was the country worst hit by the outbreak of the disease which has claimed 11 300 lives since December 2013, the vast majority in the West Africa countries of Liberia, Guinea and Sierra Leone.